Lathom has been dominated by a succession of powerful families who have made their mark, not just in the fortified buildings but in the control and manipulation of the surrounding landscape. This has resulted in a changing succession of parks whose boundaries continued to change right up until the late 18th century. 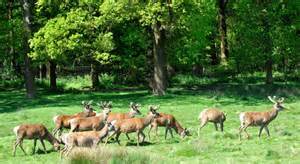 From documentary evidence, it can now be shown that the park began life as the private deer park of the De Lathom family in the mid-thirteenth century, but that the area which became the park may previously have been the principal estate of Uctred, the powerful Anglo-Saxon thane who held a quarter of the land in West Derby Hundred in 1066. The earliest references to a park at Lathom, which have so far been identified, are from the middle decades of the thirteenth century. However, following the well-known principle that the earliest reference in a written source is not necessarily the date at which something came into being, it becomes very apparent from the wording of documents circa 1250 and 1278 that the park was in existence and functioning by the former date. We can be reasonably confident that the Lathom Park must have been created a number of years before 1250. This pushes its documented origins back perhaps two centuries before the date of the grant of free warren awarded to John De Stanley, King’s knight, steward of the King's household, and Isabel his wife in 1407. In turn, another key question is raised, that is when was the park at Lathom originally established? We do not know yet, whether its origins predate the foundation of Burscough Priory in 1189-91. There is no mention of a Lathom Park in the Priory’s foundation charter, although there is no particular reason why a Lathom park should be so identified if it did not impinge on the original endowment lands and boundaries. 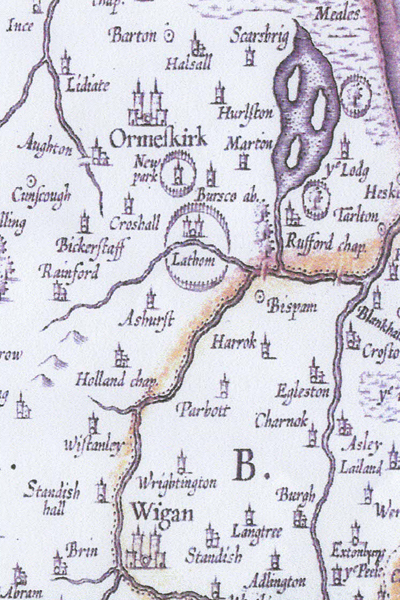 However a Burscough Park is mentioned in a later Priory charter dated between 1232 and 1286.